You know I love my summer in NY - outdoor concerts and film festivals and picnics oh my! This week we watched Red Baraat performing at Fort Greene Park in Brooklyn (have you been there? It's not quite as well-known (or as huge) as Prospect Park of course, but is lovely and has such a great neighborhoody feel to it!). The music was fun - so joyous and upbeat! 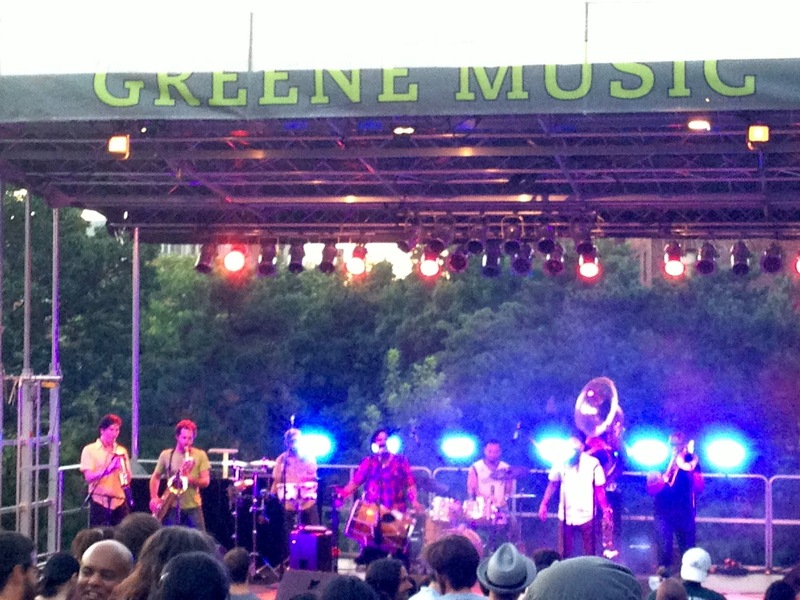 Red Baraat's music is a combination of jazz/brass/bhangra (and a few more! ), so basically a good collection of beats and rhythms to set your shoulders a-shakin' all on their own. Plus they've done takes on songs like Mast Kalandar and Rang Barse - so you know any good Bollywood movie watcher will start tapping her toes. I originally heard of them on a show by Afropop Worldwide, African Sounds of the Indian Subcontinent. Think I've got the words a bit mixed up? Nope, this wasn't about the much studied Indian diaspora in Africa (although that's a fascinating history in and of itself, and still very much a developing phenomenon), but the lesser known history of African peoples' movement into the Indian subcontinent. Did you know that there are still very identifiable communities of African Indians in India known as Sidis? Over the course of history, African migrants have also risen to positions of great power and prestige in the Indian subcontinent. Of course nowadays the descendants of the original African migrants speak the same languages, wear the same dress, and share the same religions and cultures of the different parts of India in which they live. But their music and dance still show a direct link to their African roots and heritage - fascinating! And now here's a super oldie but goodie to show you the influences of jazz on Bollywood music from wayyyy back when!